Delbard Nurseries were presenting their latest apple and pear selections on 26th September 2018. Some professionals took advantage of this visit managed by Arnaud Delbard and his team. 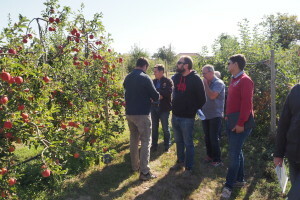 On the agenda: Visit of the selection orchard and fruit tasting of the early maturing varieties. The apple breeding program is quite unique as it is built on a broad and diverse gene pool, leveraging on Scab tolerant parental lines for more than 20 years, in addition to seeking a unique taste. This long-term effort shows great potential regarding today’s market expectations. PxA9870 for its taste presenting a balanced profile between crunch and juice, a fast coloring fruit with good holding ability on the tree. PxA5348: The Scab tolerant variety at Gala period, presenting a balanced tree with attractive fruits. PxA5232: A balanced and spreading tree, producing fruits with a good size and dark red color. Maturity is 5 to 10 days after Gala. 14 varieties on stage including 5 new numbers. 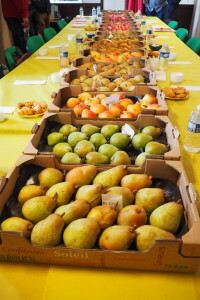 Beyond the agronomic qualities, the pear breeding program is focusing on delivering high eating experience based on the taste and a smooth texture. RX5603 for its high taste potential with a touch of tangy flavour. Still a lot of new varieties to be discovered in the selection orchard!